What are the four quadrants in integral theory? The quadrants describe four aspects or perspectives inherent in every holon (for more on holons, see our post on holons). Every holon has both an internal and external perspective to its identity, and these two perspectives have both an individual and a group aspect to them. 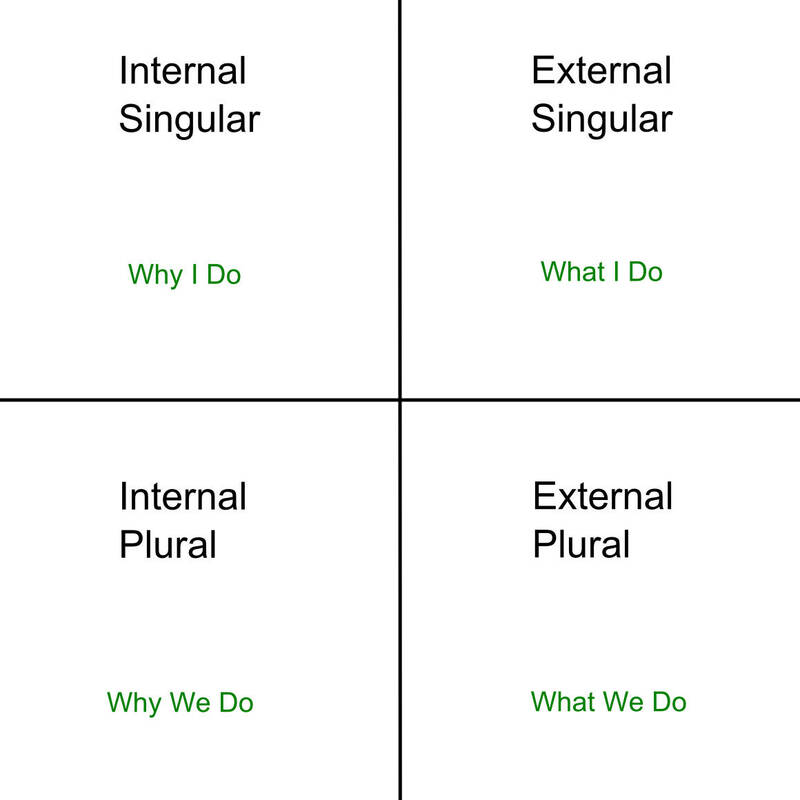 Another way to define the quadrants, which we find to be particularly useful for permaculture, is to think of the internal and external perspectives in terms of “what” we are doing versus “why” we are doing it. How is the idea of the integral quadrants useful for permaculture? One of the difficulties of understanding permaculture is that it resides in the internal singular quadrant (why I do), while the design is usually manifested in the external singular (what I do). Designs that are made using permaculture – or the elements in a design (e.g. swales and herb spirals) – are commonly mistaken for being permaculture themselves. We think that using the quadrants can help illuminate not only what permaculture is, but lead to better designs through a more thorough observation of the design site. Typically in permaculture we use the concept of zones and sectors as a way to organize our thoughts on energy inputs and expenditures. Zones are a way to place elements in our design based on the amount of energy needed by us (the permaculturist) to have an influence or make a change. 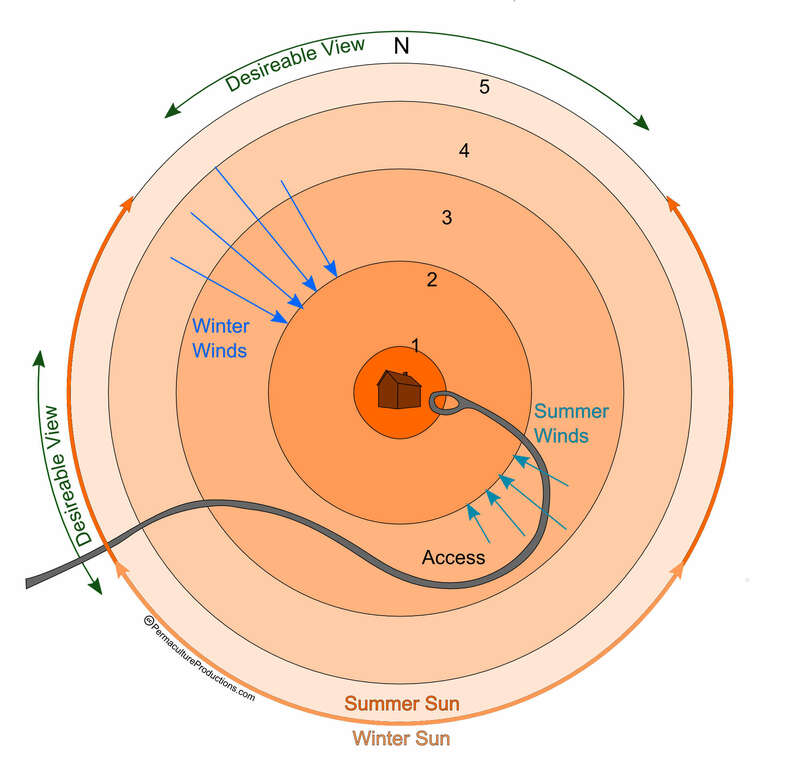 Sectors denote flows of energy that we can capture or deflect, coming into and through our permaculture designs: like sunlight, wind, water, wildlife, views, or noisy neighbors. The current permaculture concept of zones 0-5 fits neatly into the external singular quadrant, the “what I do” quadrant. 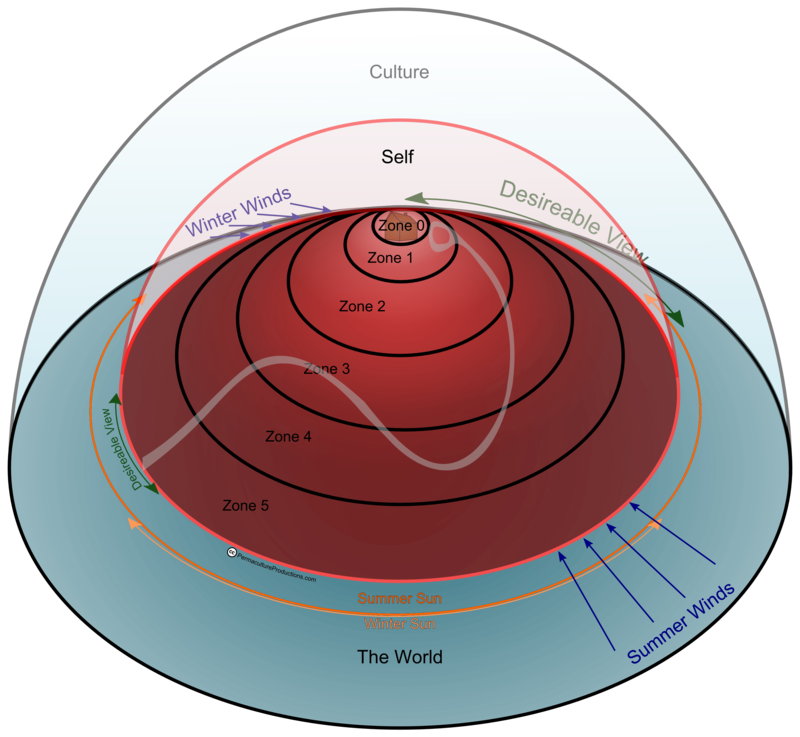 These zones are external to our person, but generally end at the border of our property or sphere of personal influence. Because we want to make sure that we are mindful of all of the potential influences on our design and our design’s effects in the world, we can use the quadrants as a tool to expand our model of zones and sectors. This expanded tool can help us more clearly identify where we can make changes to improve the success of our designs. These changes could include: adjusting our intentions, thought patterns and conceptions of our own designs (why I do); educating other people about what we are doing, how we structure contracts, or advocating for or against laws (why we do); changing behavior patterns or doing physical work in the landscape (what I do); working together with other people to build a specific project, or the sum of the changes that humans make in the landscape (what we do). The internal singular quadrant, the self, is the overarching conceptual framework for the real-world manifestations of a person’s intentions (e.g. their permaculture design), which is constantly influencing and being influenced by what’s happening on the ground. In our visualization, the self completely encompasses zones 0-5, like the glass dome encasing the contents of a snowglobe. 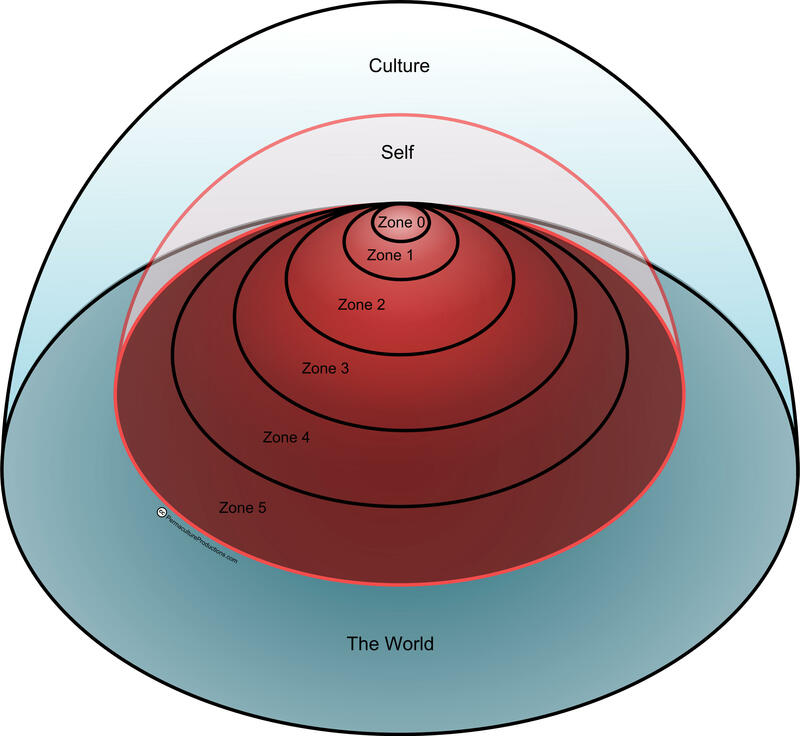 Surrounding the self and zones 0-5 of our permaculture design are the external and internal plural zones, what we will call the world and culture, respectively. These are the sources from which the flows of energy (sectors) coming in to our permaculture designs originate. The world is the societal and ecological “super-infrastructure” that encompasses “what we do” as a particular society, as a human species, and as a planetary community with all other life forms and natural forces. This super-infrastructure forms the physical basis for “what I do” in our individual daily lives and in designing for permaculture. In our visualization, zones 0-5 of a permaculture design sit atop this infrastructure and are dependent upon that base in order to exist (much like holons, and our holon mountain visualization). Sectors that come into our permaculture designs from “the world” include sunlight, wind, rain, water, climate, people, wildlife, plants, materials, pollution, views, and roads. On the internal plural side, we have culture, the “why we do.” This cultural zone encompasses the world, the self, and all of the external zones within our permaculture design. Sectors that originate from this cultural zone include: business and economics, laws, politics, tradition, concepts of property, and cultural identity or bias. It should be said that in practice, zones are not some monolithic, perfectly concentric construct, but instead are messy and reflect the interaction of many people in the real world. We have also considered expanding this model to include multiple people or locations, but thought that it would quickly increase the complexity beyond usability. What we’ve done is taken the idea of zones and sectors and expanded it so that it can encompass more than it previously did, including the concept of permaculture itself. This model makes clearer the nature of permaculture design as the “why” rather than the “what,” and thus allows us to better communicate what permaculture is. In addition, by incorporating integral theory’s quadrants, we are better able to conceptualize, understand, and design for all the influences that affect our site and the effects we cause in the world. This gives us a holistic view of how individual elements fit into the entire design, and allows us to see the environmental and socio-economic context within which they exist. Because we gain this holistic view, we reduce our wastage of energy and time by having a full picture of not only what an element does and where it should be go, but also why we are using that element from a personal and cultural perspective, and what its effects in the world will be before we place that element in our design. With this understanding, we can expect our permaculture designs to be more successful – giving us a broader, system-wide view of what and why we do something not just for the benefit of us humans, but for the rest of the landscape and its non-human inhabitants. Adaptability and self-regulation are the keys to the persistence of any system, be it an ecosystem or a permaculture design. By more thoroughly observing our site beforehand and evaluating the context in which our permaculture designs exist, we can better design our sites to adapt to change and are able to consider the impacts that our design decisions may have as they ripple outwards. This allows us to increase the adaptability and self-regulatory capacity of our designs toward the goal of their continued success. Our expanded, integral model of permaculture zones and sectors is a useful tool in our permaculture toolbox allowing us to do just that.